Divider curtains are often used in health care settings to surround patient’s bed and provide privacy. Many factors contribute to the concern that these curtains are a potential source for the transmission of pathogenic microorganisms: 1) caregivers and patients touch curtains frequently; 2) in some settings, curtains are not often cleaned or changed; 3) health care workers and patients who handle curtains do not necessarily cleanse their hands before (or after) touching them. 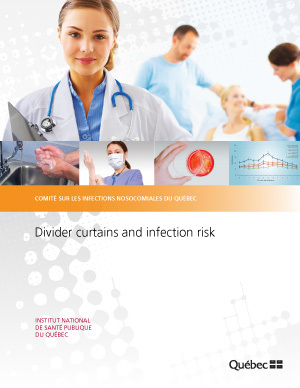 In May 2011, the Comité sur les infections nosocomiales du Québec (CINQ) was asked to provide its opinion on the frequency of cleaning and the precautions to be taken to ensure the safe handling of divider curtains. The purpose of this document is to review the evidence on the role of divider curtains in the transmission of pathogens in health care settings and to provide recommendations for the cleaning and handling of divider curtains.